My husband and I have been reflecting on what we are grateful for, and I thought it high time to let you all know how grateful we are for our cat, Scarlett. We adopted Scarlett in September 2014, when we had only been married for a few months. I remember picking her out online based on a sort of cat personality profile your volunteers had done. Scarlett was a "personal assistant" cat, and, as a "dog person," that sounded perfect to me. I was used to pets who went where I went. Sure enough, Scarlett fits that profile exactly! She always wants to be where we are, and not just when she's hungry! She is a seriously sweet cat, and loves to greet us at the door when we come home, sit right between us when we wake up in the morning, and curl up right behind us on the back of the couch when we're reading or watching a movie. My husband and I just welcomed our first child into the world, and Scarlett frequently joins in the feeding sessions by curling up on the glider ottoman between my feet or settling herself onto any soft object we happen to have dropped on the floor, and she often keeps vigil with us when the baby is up all night. She loves getting head-rubs, and her most characteristic means of requesting attention is to flop on her side or her back right at your feet. When we got Scarlett, she was a few pounds overweight, but within a couple years we had helped her get healthy by feeding her only a certain amount of food three times a day. She has stayed at a healthy weight, but does now have the beginnings of kidney disease. So we are feeding her a special diet as prescribed by the vet. She has not had any other health concerns. At about 12 years old, she is still very playful, and capable of jumping a few feet up, though she doesn't tend to try much more than that anymore. Scarlett is an excellent companion, and we are grateful to have her as part of our family. After we had Scarlett for about a year, we adopted a rescue dog from another Illinois organization. We used the adoption guidance we had received from C.A.R.E. to figure out how best to introduce the two, which was so helpful! Although the two did not get along great at first, there were never any "scary" moments. Three years later, they are just adorable together! They may never cuddle, but they are definitely friends. Scarlett will even come up to our dog, Chloe, and rub her head on Chloe's chin or leg, and Chloe will respond with a few good licks to the face. If we are petting or playing with one, the other immediately gets involved, so that the whole family ends up on the floor together. Having Scarlett has truly enriched our lives. Although of course she had another family before ours, since we adopted her at age 8, we feel like she belongs with us, and we are blessed to give her a forever home. Thank you for making that possible! We adopted Jake (shelter name Emmett) quite by a happy accident. We came in to pick up our new addition Sebastian (shelter name Astaire) in October 2007. That night as we walked into the office, a large orange and white cat was jumping up to see out the window into the waiting area. His mannerism and size reminded us of our cat Sammy who had just passed away the previous month. The office staff had brought Jake into the office area to help him socialize. My husband and I started to play with Jake and after we talked, we decided to bring Jake home with us that night too. The staff let us know that Jake had been left in his carrier outside of the shelter on a warm August day. At first Jake was hesitant to let us touch him but after much patience Jake has become a loving and affectionate cat. Eleven years later he is happy and healthy. Jake loves sitting with us in the evenings on the couch and relaxing in their sun room with his siblings, Sebastian, Callie and now Remy. We are so happy that we took a chance on Jake that night. We adopted Sebastian (shelter name Astaire) in October 2007. Our cat Sammy had just passed away the previous month and even though we still had two other cats, Max and Callie, our house seemed quiet. Our great counselor let us know that Sebastian had come to the shelter after a raid at a drug dealers house. When we were introduced to Sebastian, he walked right up to my husband and climbed into his arms. Eleven years later, he is still with us. Sebastian suffers from anxiety and has daily medication. Even with this issue, we would never give him up. He loves playing catch with his toy mouse and relaxing in our sun room on the cat furniture with his siblings. When our doorbell rings, he is the first one there to greet visitors. Halloween is his favorite holiday to greet the kids and sometimes he even lets us dress him in his Halloween costume. Thank you for connecting us with Sebastian. I wanted to write to you to give you an update on my sweet Meenah. We are celebrating a year together on 11/2/2017. Our story starts at Follow Your Nose where I met Wendy now Meenah and fell in love at first site. She was sweet and always friendly with Human and Furry alike. She had already been at Follow Your Nose for several months. I went home one day and talked to my room mate and asked her to go and meet Wendy . I told her how amazing this kitty was, And …again love at first site. Still I waited knowing that I had two other older cats and was not sure how they would handle another sister. I waited hoping she would get a good family. Always knowing that the universe had meant her for me. After several months and a failed adoption; it was time for her to join my little clan…. Best decision ever. She was shy at first but with time she figured out that this was where she was meant to be. Meenah has brought life and joy into our home. She plays and hunts with her sister. She loves to be pettted and is very vocal when she wants attention. Truly a blessing to have her. Thank you C.A.R.E for what you do. May you continue to add happiness to these pets in need of a loving family. Thank you to Raimi at Follow Your Nose for fostering all those kitty cats in need of a forever home. It sounds cheesy, but I knew Ginny was going to be a part of my family the moment she walked up to me, all wags, with her ‘adopt-me’ vest on. She came home that very week. We love her so incredibly much. My dog Theo and I visited [Evanston pet supplies shop] Follow Your Nose almost daily while Benjamin was was being fostered there. Over time, I knew he had to come home with us. Now I’m a ‘cat person’ as well, and loving it! Benjamin quickly made himself at home. He is super-sweet, affectionate, social, cuddly - and opinionated! I’m learning how to read a newspaper when someone is sitting on it, how to work with someone on my laptop (he almost hung up on my client once! ), and what it’s like to have my feet pounced on every time they move under the covers. Benjamin and his brother are doing really well together. I feel lucky to have two great boys! When I set out to fill my prescription for an Emotional Support Animal, I couldn't have dreamed of a better match than Frankie. He loves getting spoiled with cuddles and finding a way to snuggle up to me while I'm doing homework. And I love that he is so good at his favorite pastime. He fills that prescription so many times over that there's plenty of doggy love to share with my friends. It's hard to believe that Frankie's split nose made him wait for 2 months for his forever home, but I am convinced that he was waiting just for me. That heart-shaped nose is part of the charm that makes people run across the street to meet him. Everyone comments on how in sync Frankie and I are. He communicates exceedingly well and even tells me what to do sometimes. Frankie would not be the dog he is without the fantastic care and activities at CARE. I cannot thank you guys enough for my little boy! After being found on the street days before the polar vortex hit, I adopted a dog that as immediately game for anything. Riding in cars and planes, seeing new people and places don't phase him. He was a little suspicious of men at first, but that went away after only a couple of weeks. Now, he bikes with me in a papoose and does excited wiggles whenever he sees me take out either of his carriers. We adopted Glen and Penny back in September 2014. We changed their names to Cary [as in Grant] and Kabuki [because with those phenomenal whiskers she looks like a kabuki mask]. Both are flourishing--maybe a bit too much (Glen/Cary is around 16 lbs). I had been seriously considering adopting a dog for months. Every few days I found myself looking through the pictures of dogs C.A.R.E. had available for adoption. Near the end of April 2014 I decided to stop looking at pictures and visit some of the dogs I had seen. I was introduced to Dagmar, a Bulldog Terrier mix with an unusual name for a young, energetic girl who loved tennis balls. Throughout our first meeting she rarely stood still but when she did it was always to curl up at the feet of someone in the room. She left C.A.R.E. as Dagmar, despite the urging of some volunteers, but within a day she had become Rosie. It took a week or two for Rosie to settle into her new life, during which a large number of chewable objects were lost, but for the past nine months she has been wonderful. She maintains her love of tennis balls, though she has been upgraded to larger, dog designed models, and she is never far off, rarely being in a different room than me and curling up beside me at any given chance. Rosie also enjoys spending time with me at work, where she has a large, sun-filled window and the adoration of numerous passersby to keep her entertained. I am very grateful to C.A.R.E for putting the two of us together. Our two new family members are doing fine and have gotten used to each other. When you see the pictures, they look like brothers and are behaving like brothers, play-fighting over little things but helping each other out when necessary. I adopted a cat from C.A.R.E. in January of this year. Her name was Savanah at C.A.R.E., but when she became part of my family, I named her Milly. (I just liked the sound of Miriam and Milly.) Milly is doing really well! She was SOOO skinny when I brought her home, but now she has a little more flesh on her bones. She loves to play with string, and is very very very affectionate. She loves people and loves to receive head rubs. She might be one of the most affectionate kitties I have ever encountered, and others say the same about her. She loves to lick me and snuggle with me at night. We are a very happy pair! Thank you so much for helping me find her! I went to C.A.R.E. looking for a cat. I didn't find one the first time I went but the second time around I found Katie Cat (Maya). My first cat had died and at first I didn't want another cat, but I changed my tune after I met KC (as I call her for short). I met several cats in the cat area but I didn't connect with any until Katie introduced herself to me in her cool cat way. I came back the next day and took her home. I agreed to a trial adoption since I have a parakeet (now two of them) to make sure they got along. After a couple of weeks I officially adopted her and she had been with me for four years now. I just wanted to say THANK YOU for helping me adopt Murray (formerly Moose)! I had been on the look out for a small friendly dog for a while that could take long walks and cuddle on the couch and C.A.R.E helped me find the perfect dog! Murray is a great fun loving dog with a goofy personality and I absolutely love him. Thank you again C.A.R.E. for the perfect dog for me! Here are some pictures of Murray enjoying his forever home. Thank you again! I absolutely love Murray and please feel free to add any of all of these pictures to your website so they can see how sweet and awesome adopted dogs can be. I hope Murray's brother Mac is also having a great time at his new home! Meet King our new adoption thanks to your rescue. I also want to commend Mary Pat on the wonderful job in training King, he is a great member to our family. I also want to say he gets along great and has the run of the whole house. I would like to let you know how much we love our dog that we adopted from you. 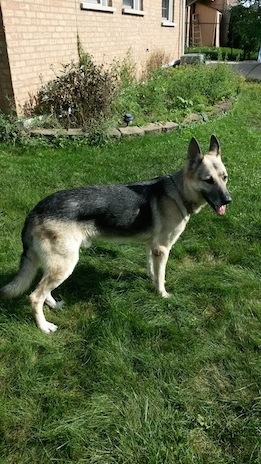 Formerly known as Lacey, our Adira is such a wonderful and loving dog. She loves her doggy classes, which we have attended for months now, and continue to go to, and we plan to eventually get her CGC certification. She loves going to the dog beach, as well as going on runs with us, but she is also happy snuggling on the couch. We want to thank you for bringing her into our lives. 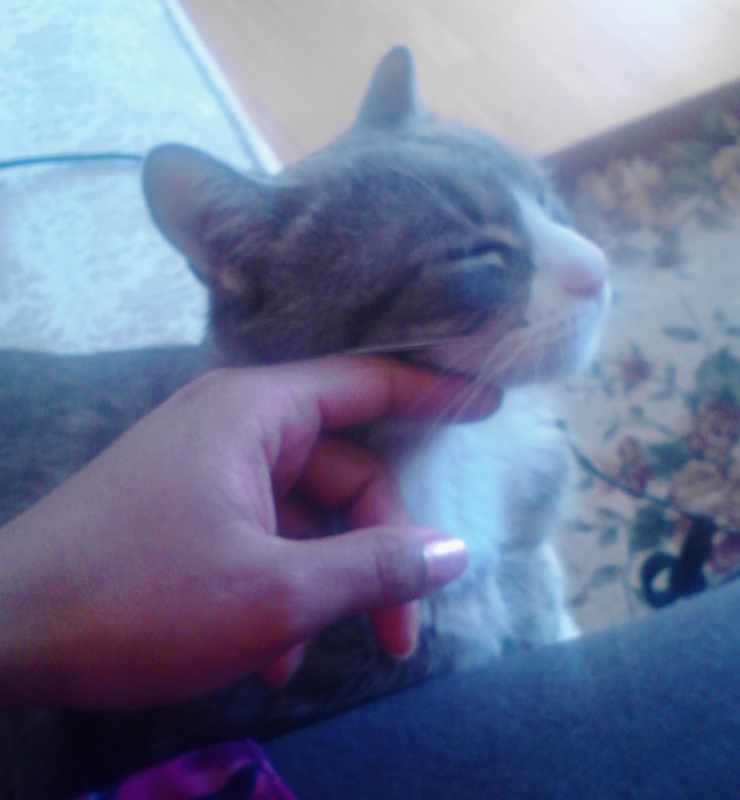 Spencer enjoys some chin skritches. Good kitty, Spencer! He acted as if he didn’t hear me. I lifted my tired self from the bed and walked over to physically move him. He didn’t even look up, he just kept staring at the floor. What was he concentrating on? It was a centipede! I screamed and yelled… ‘oh no, get him Spencer, get him! HAH HAH. My superhero cat jumped for that centipede and ate him whole. Good protein. Thank you Jesus for my Spencer. Amen! We adopted our GSD Jackson from C.A.R.E. in 2002, when he was 3-4 months old. He weighed 18 pounds. He was very intelligent, but timid and afraid of men. His tail had been broken and there were signs that he'd been abused. With activities like obedience training, agility, and lots of socialization, Jackson blossomed into a confident, happy dog. As my husband says of Jackson: 'He's appreciative and he has a sense of humor.' I would add that he's a beautiful boy. Our thanks to Wendy DeCarlo for finding Jackson for us, as well as his foster mom Darlene for the TLC. Thank you, Community Animal Rescue Effort, for all you have done. Panache was brought to the shelter by the Evanston Police, who were concerned about her condition. It seemed that she had no eyes. After one of the C.A.R.E. volunteers took her to the veterinarian immediately, it was determined that she indeed did not have eyes. We're not sure if it was caused by a bad infection, congenital defect or foul play, but the poor kitten was definitely in need of help. Volunteer Mitzie took her home to offer her a quiet place to recuperate instead of the noisy, chaotic shelter. Well, it didn't take Mitzie long to fall in love with the little kitty. Panache has a new home and a new name: Cookie. She gets around very well by sense of smell and hearing. Cats truly are amazing! Angie first arrived at C.A.R.E. six years ago. She ran into an Evanston resident's house, was brought to the shelter, and we named her Claudette. She had a microchip from the Anti-Cruelty Society, so this was at least the second shelter she had passed through. We adopted her out to a family who unfortunately had to return her to C.A.R.E. over four years later. Unfortunately, Angie didn't show well to potential adopters and remained at the shelter for almost two years. A fantastic C.A.R.E. volunteer decided to give Angie a chance to spend time out of the shelter and that's where Angie blossomed. Read Angie's story here. It was just a year ago we added sweet Ragamuffin to our family! Thanks for rescuing him and taking care of him until he could be a part of our family! From C.A.R.E. 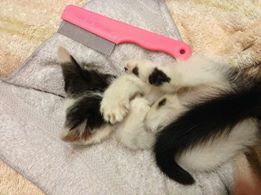 : One of our volunteers remembers how little Ragamuffin was covered with fleas when he arrived at the shelter. Each day, volunteers carefully combed the kitten to remove the fleas because he was too young and small for flea medication. "This is how tiny he was when he arrived at our shelter loaded with fleas. The fleas kept traveling toward his face so he is covering his eyes to protect them. He wasn't much larger than that pink flea comb you see him laying next to. We couldn't believe how many fleas could be on an itty bitty kitty!" 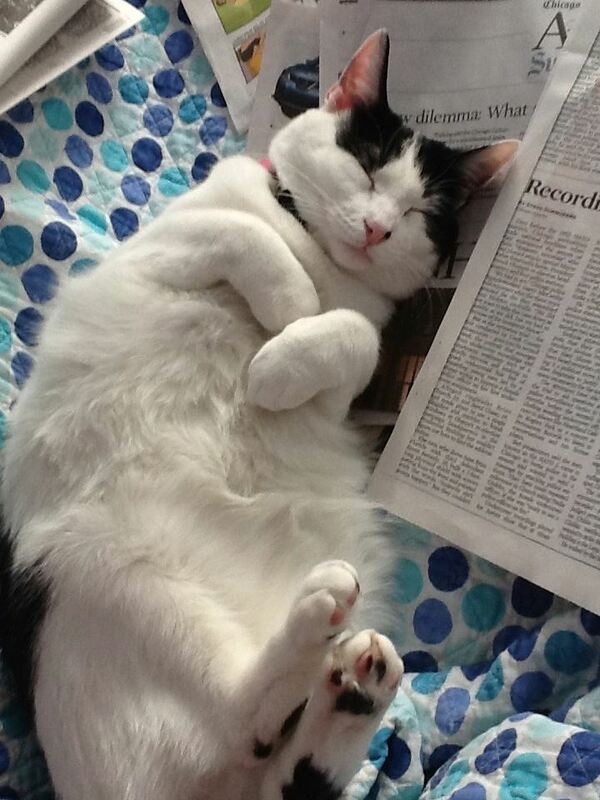 From Terra: "Here is our sweet Ragamuffin today, he still loves to lie on his back in the sun after reading the paper!"